The Catholic faith is a precious gift from God. If you feel that God is offering you this gift, we are here to help you explore the possibility of becoming a full member of the Catholic Church. Whether you have never been baptized or baptized in another faith tradition and seek full communion with the Catholic Church, we will walk with you through the stages of the Rite of Christian Initiation of Adults (RCIA). The RCIA provides a small group setting in which the inquirer is introduced to the Catholic faith—its beliefs, practices and community life. Normally, an inquirer has a sponsor, a baptized Catholic who witnesses to the Catholic Faith and accompanies them on their journey. St. John Bosco collaborates with Saint Bridget of Kildare, one of the parishes in our cluster, in the RCIA process. Classes meet Monday evenings 7:00-8:30 pm at th e St. Bridget of Kildare Parish, 5620 Hauserman Road in Parma – in their School Meeting Room #1, from September through the Feast of Pentecost in May. Catholic spouses and sponsors are welcome to attend the classes. If you are unable to make these meetings due to work or other circumstances, we will work with you to find a way that works for you. 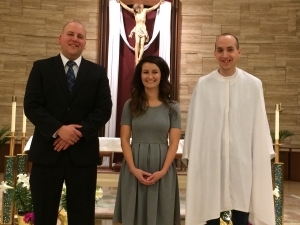 Full communion for catechumens (those not yet baptized) and candidates (those already baptized in the Christian faith) occurs at the Easter Vigil. Those interested in learning more about RCIA can email Father Jurcak or Deacon Roger or call the Parish Office at 440-886-3500. Be assured that we are here to welcome and support you as you discern this important call in your life. We also have the Rite of Christian Initiation of Children (RCIC) for children who have not been baptized. We will be happy to discuss the RCIC with you as well.